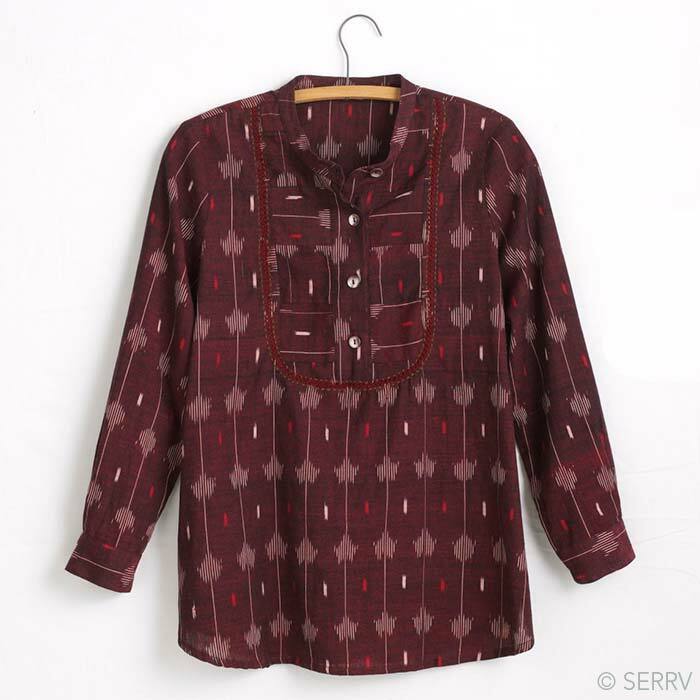 Full cotton tunic in deep burgundy ikat weave makes a stylish go-to addition to autumn wardrobes. Looks great with jeans or leggings. Curved yoke in offset print has hand-embroidered edging and four dark shell buttons. Ikat weave is a traditional dye-resist technique that involves tying and separately dyeing yarn bundles before weaving the pattern. Banded crew neckline. Slightly rounded hem with side slits. Full sleeves with button cuffs. Tunic is 29"l in size M. Machine wash cold, line dry. Celebrating Fashion Revolution Week: April 22-28! Nice material and nice cut. My daughters also loved the style. However, it runs really large and I ended up giving mine away. Such beautiful work! A gorgeous fabric is an festive but not gaudy color. I like the style which does not need an under layer and comes in at a good tunic length. Although I usually go for petite, the sleeves and length were comfortable. It will be great for casual parties and such. This tunic fits just as I hoped, It is made well and I feel good when I wear it. This looks good in the photo, but not so much in person. While the quality is ok, the bottom of the shirt is wider than it appears, so tends to add a little heft. I'm afraid it mostly looks like a man's pajama top! Disappointed, will be sending it back. Lovely color, texture and fit. This shirt will be excellent for wearing in an Iowa autumn.